This dish is perfect for those who are sick, for cold weathers or simply, just to cook a healthy meal for the family. For the record, my kids, including myself slurp this whole thing real fast as it is very sweet and tasty! A nice, simple, economical and tasty meal for the family. How can you not try it? 2) Then let it cool down after about 30 mins of boiling and drain to use the stock. 3) Wash your rice and boil them in a pot with only the stock you use from Step 1. Add the ginger slices as well. If you did not boil enough stock, and you find that you need more liquid to make the rice soft, then use normal water and add it into the pot. Main thing is try to use as much of the stock as possible as that is the one that makes it sweet. 4) Boil using low fire till you are satisfied with the water to rice ratio (not too watery or not too thick) and you see if the rice is of the softness you want. (Check out the picture closely to see how the rice should be like) Keep stirring so that the bottom does not get burnt or to prevent the rice from sticking below. 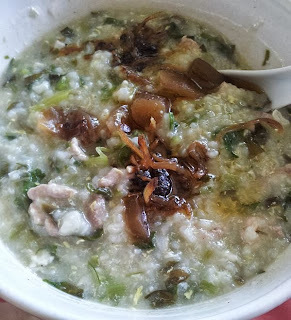 5) During the last 15 mins or so, you add the chopped spinach and pork slices/pork balls. 6) Season with salt and white pepper to taste. 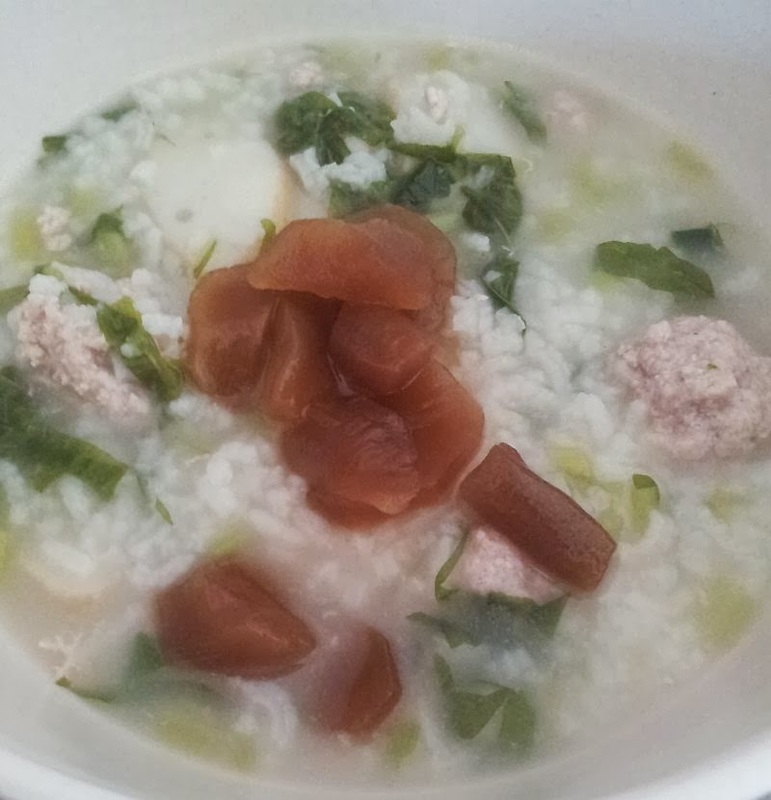 I added my favourite pickled cabbage for the crunch to the porridge. Another of my favourite compliment dish would be the fried dace canned food with black beans. These are two pictures of the times I cooked this dish. One was pork balls, and the other was pork slices.